I just love the luxurious feel of these bath mats. They truly live up to their description. I ordered them in sapphire and the color is just beautiful, exactly what I was looking for. They arrived on time and were packaged very nicely. I would purchase them again in different colors. A rich and unique pair that complements any home bathroom decor with ease, these plush bath rugs are made from premium combed cotton for a soft, comfortable feel under foot. Ten fresh color options and a sleek carved concentric oval border pattern give these two differently sized rugs an impressive touch of style that's sure to delight everyone who sees them. I FINALLY found oval bath rugs to replace my old ones (more difficult to find than I expected - most are rectangular), and these are a very high quality. This was my first ever purchase from Overstock (along with some other furniture items) and I am very pleased with every aspect of my buying experience! 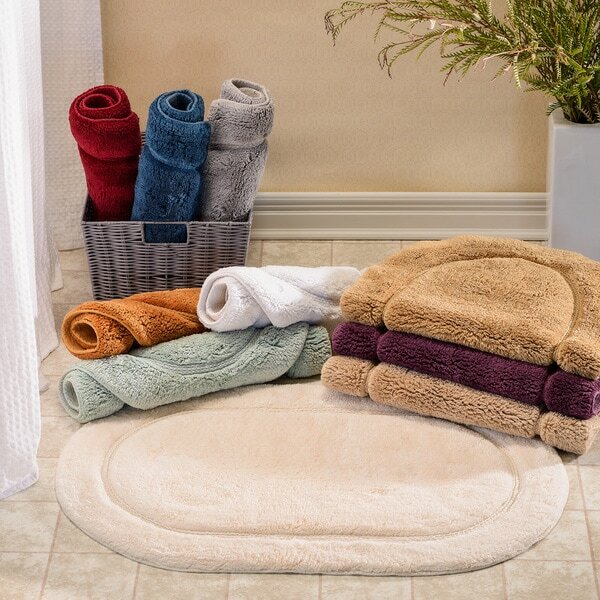 Great set of COTTON Non-skid Oval Bath Rug 2-piece. They have held up well and I like the oval shape. It's not a bad rug, but when you advertise as "non-skid", you had better be "non-skid". This thing slides all over the place. But it's a slow skid. Like, you'll be applying your make-up on in front of the bathroom mirror. You lean in to get that eyeliner just right. As you lean in you realize suddenly that all of your leg muscles have grown stiff trying to keep your face from falling into the mirror as the rug slowly, but surely, starts sliding away beneath your feet. At first, you'll think it's just your own equilibrium being off at that moment; but when it happens every single time, you'll catch on that it's not you. It's the freaking rug moving under your feet! If you can live with a non-skid rug that skids anyway, then you will love this rug. But, if like me, you really wanted a non-skid rug so you could put your face on in the morning without feeling like you're going to fall into the sink because the rug you're standing on is as stable as a skateboard, then you'll want to pass on this sucker. I have a small bathroom but the two rugs look great in it. The big one is big enough to put in front of the sink and the small one in front of the shower. I am very disappointed with this purchase. After you walk on these rugs a few times they become totally flat and unattractive. I was looking for a more cushy rug. I should have ordered the shag rug, but was distracted by the shape of this one. I removed them after a week and a half. I would not recommend these rugs. My first time for oval rugs. I love them. The color sage is so beautiful. This color is so delicate. The rugs are soft plus the do not shed all over the bathroom floor. I would recommend them and would purchase again. These rugs were just as described. I have owned them for about a month. My sister loved them and will be ordering them too. Love the color - exactly what I was looking for. A plum purple, which I could not find in any store. All cotton, no backing - but they stay put as well as any rug I've had with a backing. I recommend these rugs - love the oval shape, too. I love these rugs. They are very soft and absorbant. The plum color is rich and looks great in my bath. I bought these because they were the perfect color, but the first time I washed them, I had blue fuzz all over the house. Also, the non-slip backing is only so-so. I was very disappointed. Not happy with my first order from overstock. You could get nicer rugs at Walmart for a lot less. I was shocked when I looked at the price I paid. The smaller rug had about 10+ holes where the rug was pulled out. The quality of the rug and the color is very poor. The silver looks like a faded green. A fair price for these rugs would be about $**. **for 2. Had these for about two years , washes up good,color does not fade still looks good as the day I bought them. Nice size but fades quickly and messy in the wash.
Every time I wash these bath mats, they shed and make a horrid mess inside the washing machine. It looks like I murdered and washed a tabby cat in there. If you simply put them outside to dry after a quick shower, be prepared to have the color fade to a pale salmon... Heck, you might prefer salmon but I bought it in copper and hoped it would stay that way. The shape and size are nice though. Loved color choices,nice selection sizes, and washes and dries beautifully. Given as a gift. They love them both! I've never bought rugs in the color of ivory before, but the color I really wanted was sold out. Although, I will say that I'm not disappointed with my purchase because they are very well made, and provides comfort when standing on them. They really go very well with my bathroom décor. I was amazed at the size of the rugs when I opened the package. I would definitely recommend this product! I bought myself these rugs and I also bought my daughter-in law some. Hers really look nice. I haven't put mine down yet. The style of the rug is nice however the fibers don’t seem to sway the same way which makes the rug look dirty. I still have them in my bathroom just wish the material was a bit softer. The quality of the rugs is very good. The silver color has more of a blue tint than gray. They are very thick and have a luxurious feel when you come out of the shower. Very nice and thick. So warm and soft to stand on. these rugs are beautiful. They are so thick and full and feel so good under your feet in the morning, Well worth the money. Hello lada, this is a two-piece rug set and the dimensions of the rugs are: 24 inches wide x 36 inches long and 20 inches wide x 30 inches long. Thank you for shopping with us.